I am sure you must have definitely seen the Airtel 4G advertisement running on various TV channels. If you always thought of having very fast internet speed, then now you have it. Yes, the fastest 4G network is here and is brought to you by none other than one of the most popular mobile networks in India- Airtel. One of the major problems and reason of frustration while browsing internet is slow and unstable internet connection. If you are watching videos online or downloading from the internet we face very slow speed and unstable connection. I am usually frustrated while doing full movie downloads and watching videos online as it takes a lot of time for buffering and downloading stuff online. But now we don’t have a reason to worry as Airtel has launched 4G facility throughout India. 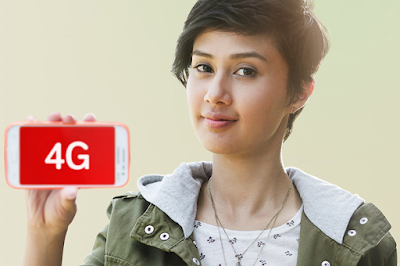 Airtel 4G is the first telecom operator to roll out 4G services in India. They have launched the service throughout India across 296 cities. You can enjoy very fast internet speed and Airtel claims that if any other network is faster than their network, they will pay your mobile bills for life. Now you might think that since its 4G, the prices of usage will be on the higher side. But the best part is that they have kept the prices really low and as a result it is affordable for everyone. The 4G plans are available at 3G prices. Now you can enjoy 4G at the price of 3G. To enjoy 4G service all you need is a 4G enabled device and Airtel 4G SIM card. The best things is that many popular smartphones Xiaomi Mi4i, Yu Yureka Plus, Moto G 3rd generation 4G, Lenovo K3 Note etc are already 4G enabled. So if you have already have a 4G enabled device, you can start enjoying 4G service or if you don't have a 4G enabled device, you can buy one as they are available for very economical prices even at 10k. One unique and innovative thing which Airtel has introduced is that you can get a Free Airtel 4G SIM by just tweeting from your Twitter account. You can login to your existing Twitter account (or register for a new account if you already don’t have one) and simply tweet with hashtag #GetAirtel4G. That’s it. They will deliver the SIM at your doorstep free of charge. Now you can enjoy fast internet speed without a burden on your pocket. Switch to Airtel and enjoy superior network and fast internet speed with their 4G network. You can also see below video about Airtel 4G Network below. So don’t waste time and switch to Airtel 4G.